Drupal 7 themes are quite popular and for a good reason. The themes have been designed and created for especially to work with the Drupal 7 CMS platform. Drupal 7 is no longer a new player and you can find a lot of useful premium and free Drupal 7 themes online. This version of Drupal is said to be easy and flexible to work with compared to older versions and the Drupal 7 themes provide developers with a strong footing to accomplish website projects in Drupal 7. Due to the large number of Drupal 7 themes that are available from many sources, finding the best Drupal theme is a challenging task for many. Hence, I was inspired to collect more than 30 useful Drupal 7 themes and present them all in this post. The Drupal 7 themes that you will find below are some of the best designs that are available currently. I hope you will find time to tell us what you think of my collection of Drupal 7 themes in the comment section. Also, please share it with your friends. 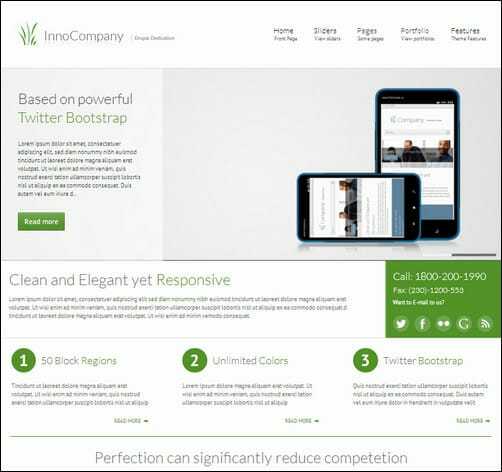 InnoCompany is incredible customizable, powerful, clean, modern yet responsive Drupal 7 theme. Not only you can use it as corporate Drupal theme but you can also use it anywhere and anyway you want. “Perspective” is Premium Drupal Theme suitable for all type of business. It comes with a lot of HTML Shortcodes, jquery plugins (tabs, accordion, sliders…) and with ability to edit the design very easy. DESIGNMD -01 is clean and modern responsive Drupal 7 theme. With a responsive design it is easily usable with any device, without removing any content! Can be used by photographers, portfolio, companies, private blogs and more. The Little Khan is a Powerful Premium Drupal 7 Theme designed in a clean and minimalistic style. This theme provides all the main functionality you will need to present your products, work and yourself in an elegant and professional style. Little Khan easy for customizing and well documented. The theme is best suited for any portfolio, business and photography. Humble is a Premium Drupal Theme, designed in a clean and minimalistic style. Whether your a Drupal advanced user or just a beginner, you’ll have absolutely no problems working with this theme. The Theme Options is very clear and easy to use! Clean Theme is a great looking Drupal 7 theme that has a very clean and minimal design yet it is still pretty modern and elegant looking. This theme has a very minimalistic design that is ideal for bloggers, business and portfolio websites. Glossy is a Drupal powered theme designed with Drupal flexibility and WordPress simplicity in mind. It has most of components that you need to create a fully functional and powerful website in a minute. This theme is extremely flexible on both layout and functionality side. On the other side you will surprise how it can be easy to change the layout and design of your website. I bet you goanna love this theme from the very first moment. Professional Theme is a very modern and professional Drupal theme that is perfect for all sorts of corporate and small business websites. It comes with a very elegant and professional responsive design that is sure to impress no matter what screen size your visitors are using. Corporate X is a fully responsive multipurpose theme for creating “content flexible” Drupal 7 websites in minutes. It’s built over the most recent and recommended Drupal version: 7.15, so you can start from a “scratch brand new base” on building a long term support solution for your clients. This theme is the backbone of the Transcription Distribution. It would be better for you to download the entire distribution, which includes the modules and install profile. Cenus is unique template to show off your portfolio/projects. It has modern & minimalist style. Powered by custom jquery. Use it to attract your client. Get ‘Cenus’ now! The Bigshop is a Responsive and Powerful Premium Drupal E-Commerce Theme, designed in a clean and minimalistic style. This theme provides all the main functionality you will need to present your products, work and yourself in an elegant and professional style. Bigshop easy for customizing and well documented. The theme is best suited for company online store. Responsive Drupal Theme – Serve an optimised version of the volumes theme to your visitors using tablet and mobile devices. Optimised for iPad and iPhone. Spark is a great Drupal 7 theme specially designed for Corporate, Business, Portfolio type websites. Yara is a responsive theme that is compatible on all devices (Desktop, Laptop, Mini Laptop, Tablet, iPad, Mobiles phones, iPhone, Android phones, windows phones etc.z)It has layered PSD for easy customization and Drupal 7 ready. PureWave is a Drupal 7 theme with lots of features. It has most of the features like blog, forum needed to create a full functional and powerful website. It is perfect for business, portfolio and personal websites. SuperShop is a great Drupal 7 theme specially designed for Ubercart / eCommerce websites. With SuperShop theme you can get your online store / website ready in few minutes. A Drupal 7 compatible theme that features an admin panel. Sources available are PSP and PSD. This is a Drupal 7 version that features a jQuery slider, custom front page, theme settings panel and lots of custom collapsible blocks regions. The sources that are available for this Drupal 7 Compatible theme are SWF, PHP, FLA and PSD.